I have left arm pain and my right arm is sore and goes numb. I'm having trouble with balance and dizziness. I'm starting to fall just getting up and getting into a sitting position on the bed. I can't do getting up and down off the toilet and I can't get in and out of a chair. Standing up takes everything I have. I also can't get in and out of the bathtub anymore, I got stuck in there for 2 hours. I'm really scared. I have had a stroke before. I had been tired for a while, no pain, just so dizzy I couldn't stand up unaided. Other stroke symptoms were my lips and face were numb and I had pins and needles. Pain in the left side of my brain and my left arm at the same time were my stroke symptoms. I woke up needing to go to the toilet, I got out of bed and fell on the floor. I was able to drag myself up but fell again. My partner was asleep so I shouted at him for his help, he helped me up back into bed, where I fell back to sleep. When I woke up I reached out for my glasses and I realized my left arm had gone weak and numb. My partner said the left hand side of my face had drooped, by the time ambulance came my speech was badly slurred and I couldn't walk. Daily numbness attacks of my head, face, forehead, eyes, left arm, hand, feet, left facial droop and slurred speech that are intermittent daily events. My stroke symptoms began on January 14, 2013. I have short term memory problems and super fatigue. Also feel like I have the flu. I can only cope with the brain effects after the attacks. I also have numbness of the right side of my face that causes confusion, and trouble with word finding. It is hard to carry on a conversation with others. I cry also. About 5 or 6 times a day I have started to get this feeling, it can happen anywhere at any time. I feel very dizzy, near passing out, lose control of walking and talking, and get tingling all over even my brain. I am worried if these are stroke symptoms. I'm 83 and in fairly good health. I was working on the computer and my left hand became unusable for about 30 seconds. Then it was fine. I am worried if it is a stroke symptom. When I press my finger on the right side of my head it gives me a pain. I am worried about a stroke. I'm 30 years old and male. I was at the emergency room when I had a sudden pins and needles numbness go across my cheeks. It continued to go down my face and into my arms. Within a matter of seconds I couldn't speak. My arms were locked, my fingers extended. I had a hard time speaking and getting the people around me to listen that this wasn't normal. I couldn't move my body at all! I tried to yell and call. All I could say was I can't move. They said it was an anxiety attack. I think they were stroke symptoms. I woke up Sunday with a severe headache on the right side, took a couple of Aleve tablets which didn't help. Finally I got in to my doctor on Monday and he sent me to the emergency room for a CT scan. I was diagnosed with a stroke. I was fortunate in that it didn't affect my speech or motor skills. However I lost vision in the left side of both eyes with instructions of no driving. My stroke was not caused by a blood clot, but to be safe I was put on a heart monitor for a month to see if I had atrial fibrillation which can cause blood clots and I do. I am now on a blood thinner. I was extremely dizzy, tried to balance myself and saw that the right side of my body was collapsing under me. It lasted about 15 seconds. I took aspirin right away and went to the emergency room on advice of my nurse. Bloodwork and CT were normal. I started working about 6 months ago. It took me a while to get used to being on my feet 8 hours a day. Past few months I have had leg aches and cramps at night. I was receiving chemotherapy for the 3rd round. About 3/4th of the way through I got very hot, water running down my head. I got very weak on my right side but had all thought processes. When trying to speak with anybody it sounded like 'marble mouth'. Very scary. Doctor thinks chemotherapy might have triggered the stroke. I was at home, sitting on the couch when I began to feel a sensation across my upper lip. A little later that area became numb. I waited too long to go to the emergency room. Four hours passed until it hit me that this was getting worse. I was hospitalized for 18 days. One week prior, I was very weak and jut needed to sit down most of the time. I could almost feel a different kind of blood flow to my head and also experienced vomiting. The night I had multiple strokes on left brain I thought I had a migraine and took Imitrex. I was out the day before with my family, it was a hot day and I had to buy a hat, for the sun was hot. The next morning I sat at the side of my bed and my mind went totally blank for a second I think. I started choking and my daughter asked me what was wrong. I could not respond properly and was thinking, she should just give me a minute. She said," Mom, we are calling 911, I think you are having a stroke!" She later told me my mouth was funny and I had slurred speech. I had a TIA (transient ischemic attack). My whole life changed, my outlook changed, now three years later I still have left sided weakness, I do Tai Chi 4 times a week, but have lots of hip pain from my osteoporosis. I am still thankful for my daughter being there and knowing what to do. Had I been home by myself, I may not be writing this today! Otherwise I am in great health. I woke up with the right side of my face limp. I can't squint my right eye or move the right side of my mouth. I am worried if it is a stroke. My left hand has been lame for the last 7 hours I don't know what is happening or if this is a sign of a stroke. I've been getting headaches and feeling dizzy with pressure on the left side of my head. I feel like I could do something silly at times like picking up food off the floor and eat it. I am wondering if these are stroke symptoms. Since last three years I feel uneasy in my right hand and leg, and day to day it is increasing. Presently my writing ability is decreasing and I am walking slow and walking like a lame man. Last 6 months I have been feeling pain in my back bone if I am sitting in the chair for longer than 2 hours. I think they might be stroke symptoms and I need medicine. I went to sleep lying on my right side and I woke up to losing complete feeling in my left arm from the left shoulder down. Everything went back to normal within 15 minutes after but this has never happened to me before on this scale. 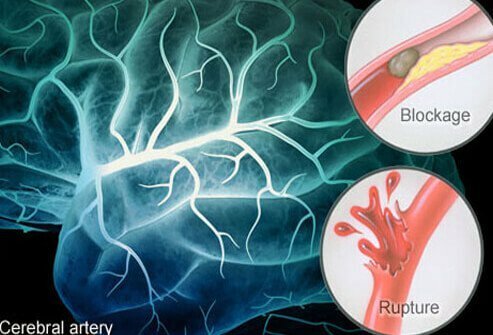 This could be a nerve issue but I honestly do not know if it is a stroke symptom. I woke up and walked to the window, and my arms and legs were paralyzed. I took two aspirins and one hour later my stroke symptoms got better. I have had a headache for 13 days straight. My right hand and foot keep swelling, and I get dizziness and been passing out. I've been to the family doctor twice and hospital once, but none of them has checked me out for a possible stroke, they just gave me 12 different medicines. I'm only 28 years old, I'm to the point of losing it here. My grandpa is 93 years old and he is suffering from stroke caused by blood pressure and he lost his body balance, right arm motion and speech, but does have some movements in the right leg. Left half of his body works normally, the neurologist said that there was a leak of blood in the thalamus part of the brain. He had the stroke attack 7 days back, presently he is bedridden and the neurologist said he will be in this state as long as he lives. I was at work the moment of my stroke. I was booking a flight for a customer and I asked her kindly "may I place your call on hold for a brief moment?" I put her on hold then sat still not moving nothing. I couldn't remember where I was or what I was doing almost as if I was losing consciousness, but someone called 911 and they took me to the hospital and they said I had a stroke from a clot. I had slurred speech loss of memory sleep apnea couldn't see properly couldn't walk or stand for long periods of time. I was in rehabilitation for about 1yr. I got out of rehab and went back to my job and then left for Texas. God has been good to me and the people around me that help me to be where I am today is all because of God. I don't sleep very well today one side of my body gets numb and tingly to this day. I don't know why. I awoke with really violent pains over the top of my head. I tripped at every step with my left foot. Voices sounded far away and hollow. The next day I became very confused and lost half my sight, so I was bumping into everything and everyone. I couldn't see anything to the left. I apologized for bumping into a wheelchair and then bumped into the pusher. I could only read the last few letters of long words, I gathered 'ion' must be 'reception.' Following a nurse who turned left I went straight on until she called me to go 'this way'. I couldn't stand up for hours but did not lose consciousness.T he hospital doctor said my BP was 'way out of control' My left side was very weak and I couldn't raise my left leg. With stroke 4 I lost half my hearing in both ears, and I have impaired eyesight. I am left with memory loss and since my last stroke in November I have basal ganglia which affects my balance - and my emotions! I get quite cross now. I was always very placid and quiet. I believe the basal ganglia was brought on by my having had 12 CT brain scans and 1 MRI, as I am told it is caused by radiation. Not to mention my heart, circulation, sleep apnoea effects... ask me another! I wonder if a losing bladder control a symptom of stroke. When I had a stroke on my right side, I get this feeling I never had before. I developed a skin rash after having a CVA (cerebrovascular accident). I was getting dressed and became very dizzy and nauseated. I sat on the floor and called for my hubby. By that time, my speech was slurred and my left side was weak. I was blessed to have my stepson there, who has first responder training, recognized the symptoms, and called 911. I was at the hospital within 1 ½ hours and got the tissue plasminogen activator ( tPA), which worked. With my stroke, I experienced numbness on the left side of my body. I felt very disoriented, even though I knew where I was. It affected my vision in my right eye. It was as if I was looking at a photo with a paper blocking my vision. I woke up in the morning with my left arm numb and tingling later in the day i was very dizzy. When I had my stroke the only warning I had was a vision disturbance…within half-hour I had a major stroke that left me completely paralyzed on the right side. I had the stroke in October 2007. I have had a slow recovery rate, but I am alive to tell others to be aware of the signs. I had an aneurysm coiled. I went home for 3 days, had headaches, very grumpy, and on the 3rd day I collapsed in the shower with bleeding on the brain, which was removed by emergency. I was in a coma for 10 days and in the hospital for 6 weeks. It has been four months now, I am still in rehab. In 2005 I experienced a lot of stress. Normally I don't get headaches but in September of that year I had a terrible headache starting from the base of the skull and up. My head was pounding. It started on a Friday. I worked that day. I was doing 2 jobs at the time. I was on high blood pressure medication but did not take anything for the headache. This continued through the weekend. On the Sunday of that weekend my supervisor sent me to the hospital. They did not diagnose me with stroke but my doctor said I did have a stroke. At the hospital my blood pressure was extremely high and they dosed me down with pain killers. They did all kinds of tests and did not find any blockages. I am a 44 year old male, Chinese American, obese with a body index of over 40, type two diabetic, with high blood pressure controlled by medicine, former smoker, sedentary due to an injury three years before stroke, before that active with job that entailed a lot of labor. Late Sunday evening I went to urinate. While urinating my right hand, forearm, foot, lower leg started to tingle, almost like an electrical shock. When going back to the bedroom, I noticed a slight problem with balance. I told my wife and we discussed what it might be. I then examined my body and in addition to what I described before on my right side, I discovered that the right side of my face was numb, including my lips and gums. The facial numbness was very similar to being given Novocain at a dentist. Early the next morning I went to the emergency department at my local hospital. I described my symptoms and they did the standard vital signs and blood tests. They did not believe I had a stroke and did nothing for treatment. I still had the same symptoms from the night before. They did however admit me for observation. That night I had a similar experience that seemed to "fill in" the remaining not numb parts, right trunk and right thigh. I informed my nurse. The next morning I called my General Doctor and informed him of what had happened, and my concern that the hospital was just observing, not treating me, and not thinking it could be a stroke. He called the Doctor on duty and discussed my care. The attending doctor came in and advised me that they would have a neurologist see me the next day at my doctor's insistence. The next day, now fully numb on my right side with tingling on my lower right leg and right hand and forearm (almost painful), I was seen by a neurologist. He said he did not think I had a stroke, he believed it was diabetic neuropathy, but was going to do a ct scan and MRI later in the day. The results were that I had had a small Ischemic stroke. I could walk, talk and swallow, so I went home. I followed up with my doctor the next day. I had been on a low dose aspirin for a year. In the next week I found it hard to manipulate things with my right hand, keys, forks, using a keyboard, video game controller, and a snow plow with a joystick controller. I had balance problems, especially at night with no visual references. I noticed that my mind seamed to be foggy, not bad, but could not do math in my head as well as before. My right side started to get weak especially my hand. My doctor wanted me to go to physical therapy to learn how to use my left hand. I objected to this and just concentrated on not loosing the use of my right hand. I would not compensate with my left. It has helped, and my right hand is not loosing dexterity or strength. I did the same with my balance. I did martial arts exercises to strengthen my right side to improve my mobility, and it has helped. My doctor approved of the results. I still have problems sensing strength in my right hand. I drop forks and other utensils as I can't tell how hard I am holding things. It has been 18 months and I have not regained any sensation. I am thankful that it was not worse. I know how lucky I am to have such an easy time with this. I would like to let others in my situation know not to give up. Keep using your hand, work it and work it. I have learned to type again, so some improvement is possible. Also, I would not have been able to go through this with out my wife, so if you have a supportive partner, let them know how much you appreciate them. Weeks before my stroke, I experienced waves of nausea. When I would lie in bed at night, the right side of my throat felt like pressure was being applied to it. I also had many, many PVCs two months before my stroke and one month after. My jaw felt sore. My personality changed. I was snapping at people and saying things that were out of character. I was sitting at my computer when my left arm and leg went numb, beyond the feeling you have when your arm or leg falls asleep. I thought it would pass, so I went over to my couch to see if it would. It did not. I managed to go downstairs in my apartment building, and someone told me go to the ER. I called my doctor, and the nurse told me to go to the ER. This was after a couple of hours. I was treated in the ER, and admitted overnight, and discharged the next evening, because I regained use of my leg and arm. I do not recommend anyone be as stupid as I was, I should have gone to the ER right then. I have been having a headache for almost a week. I went to the doctor and they prescribe me Lisinopril and Hydrochlorothiazide 10-12.5mg. Every since I have been taking the medicine I have noticed that my left side of my face is swollen. I am seeing a ripple in the left eye and I am having a sharp sticking in the both temples but not at the same time it comes with dizziness like sea sickness. Sometimes I have a feeling like there is crawling on the top of my head and also my heart is fluttering and it feels like my heart goes up and drops. Also in my neck it feels like my heart is beating real fast. I am also having twitching in the arms and legs and sometimes it feels like a pin sticking me. My sinuses are also being affected tremendously. My father is in the hospital as I write this. On Sunday he experienced a stroke while driving his car. He ran into the curb and crashed. He was taken immediately to the ER where they were quick to diagnose a stroke. The CT scan revealed a minor stroke had occurred within 48 hours prior to the accident. The doctors said the "clot-busters" would not be administered. He has lost mobility to the right side of his body, and his speech is very slow and heavily slurred. It has been 3 days now and he can finally answer questions with short simple answers. Although he does not seem to completely comprehend what the question is. I just want him to get better and come home now. My son had a stroke and the neuro doctors say it was caused by a spike in blood pressure and heart rate, caused by the adrenal gland. Have you ever heard of this before? His speech is good but his throat has been affected and it is very hard for him to swallow. Could you give me any comments on this? I had a severe headache for almost two weeks with vision disturbances and numbness in my right jaw. The ER doctor said it was a migraine. Ten days after the onset of symptoms, I fell out of bed when I tried to get up. I could hardly see or walk. It felt like I was drunk. I am forty-seven years old and have lupus anti coagulant and was on blood thinners (not enough). I was blessed to have recovered well. I am still tired a lot, ringing in my head, headaches and my short term memory is not good, but I can walk and talk and smile the same as I always did. TIA's can trick you. I thought my legs were buckling and I would fall. By the way I've been a nurse over 25 years and didn't see it coming. I fell and couldn't get up again. I was admitted to the hospital with CVA left side which caused paralysis on the right side. This has been unreal, but I am adjusting. Just before I turned 25, I had a stroke. I was working at a fast-food place and my shift was two hours from ending when I started feeling dizzy. I didn't think anything of it then. It went away, but I couldn't see from my left eye. I could not read the left side of the tickets. I let my manager know that I couldn't see, and I thought maybe in a couple of seconds I would regain my sight. My sight returned after a couple of minutes, but then I lost feeling in my arm and then all of my face. I was at work when I felt very dizzy and felt that I couldn't stand up for more than a second. So I asked my boss if I could go to the emergency yet I couldn't drive so I waited for my husband. The doctors asked me what I had so I told them my dizziness and numbness on my right side, by then I had a headache that wasn't too bad. After four hours, they didn't find a reason why I should stay. They thought it was a migraine, so I went home. The next day, I woke up with my right side of my body immobile and my speech slurred, so I had another visit to the emergency room. They said it was just stress. Again I was sent home, and five days later, I went to my general doctor and he told me to go again. So I did, and I was diagnosed with a stroke. But because I am 29-year-old female, they didn't think I was having a stroke. I had weakness in face and in my left arm which I still have.